I am authoring this post, even though Mia was responsible for the meal in every way, because I already published it to my blog. 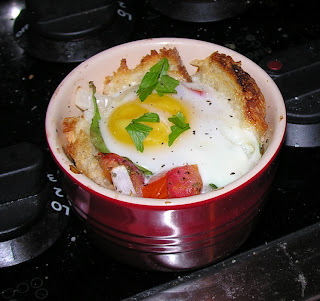 Inspired by my new favorite food blog, 101cookbooks.com, I decided to experiment with baked eggs this morning. 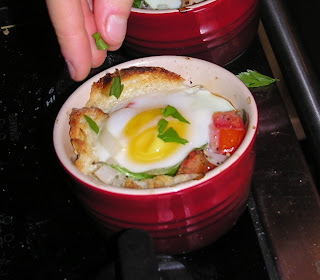 We used oiled ramekins, lined them with bread (whole wheat pita for me, sourdough toast for Jonathan), piled in a few diced tomatoes and onions, seasoned with parsley, salt, and pepper, and then plopped an egg on top. We baked them at 425F for about 10 minutes, just until the yoke was set. They were fantastic. Similar in gooey deliciousness to poached eggs, but with all the flavors of a tasty omelette.